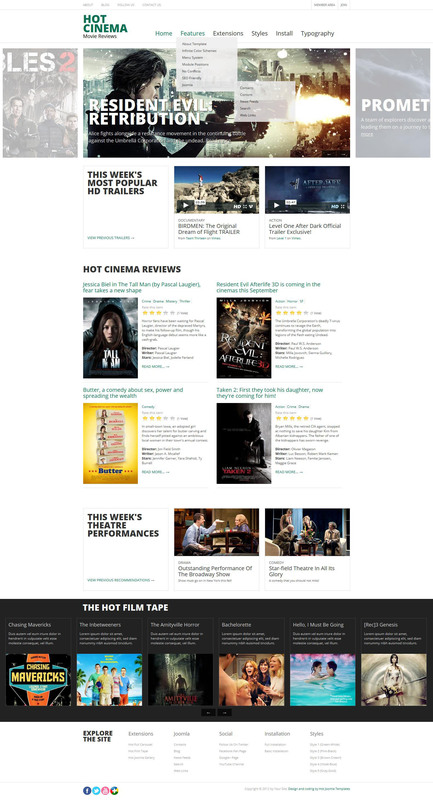 HOT Cinema - functional template from the team HotJoomla, ideal for sites devoted to cinema. Exquisite and light design template worked very efficiently, there are 5 preset styles that provide a choice of optimal appearance. Specifically for this template was created by the developers of two new modules: Hot Full Carousel and Hot Film Tape, which are designed to easily display the content on the site. Quick Start template already contains the installed modules, whose work can be fully appreciated on the demo page. In the assembly is a popular component K2, which increases the potential and possibilities of the template. Cinema has a fast speed of loading pages and supports a variety of mobile platforms.